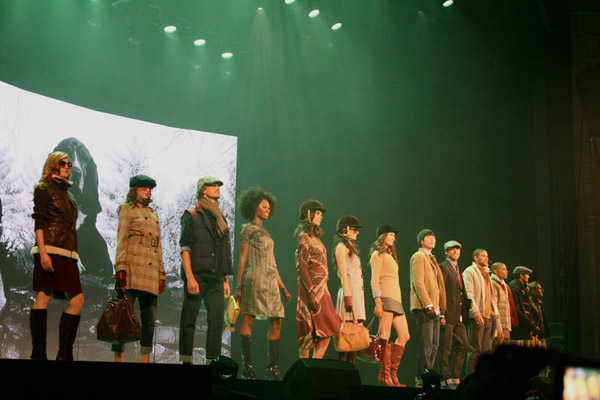 Models showing off Tommy Hilfiger’s fall line at Macy’s Glamorama. There’s never a dull moment in the style sphere, and just as London Fashion Week was kicking off with its first round of shows on Friday, San Francisco made its own sartorial hop across the pond at Glamorama: The British Invasion. The annual Macy’s Passport event, held each year at the Orpheum Theater to raise money for HIV/AIDS charities including Glide and Project Open Hand, showcases the department store’s fall offerings in an exciting marriage of upcoming trends, dance routines, and pop music. Interspersed with classic covers of The Beatles, Rolling Stones, and The Clash were live performances from Karmin and Robin Thicke, setting the tone for modern mode mixed with traditional British flavor. Tommy Hilfiger opened the show with a collection of preppy men’s and womenswear fit for a boarding school class after a jaunt on horseback. Patterns of plaid and tattersall played across ladies’ coats and dresses while trim knits and casual cords cozied up in warm, earthy tones such as mustard, burgundy, and beige; meanwhile, men sported casual blazers, tailored jeans, and pageboy caps with a relaxed, East Coast vibe. Models wearing W118 by Walter Baker emerged from a British phone booth dressed in sleek contrasting separates, wool sheaths, and leatherette leggings in a downtown-meets-ladylike aesthetic. 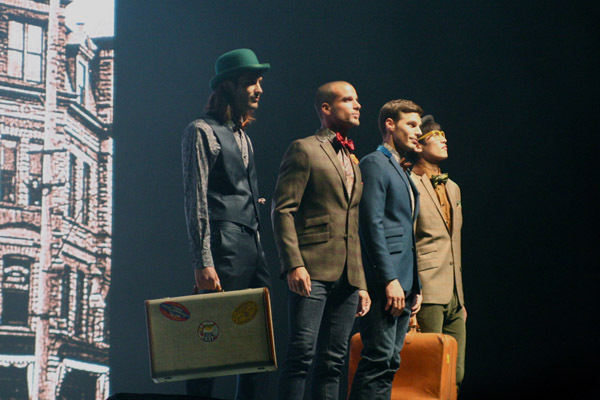 Tallia Orange’s strapping gents quickly usurped the stage, however, in a flurry of tweed coats, tartan toppers, and daytime suits. After a hip-hop interlude featuring “Green Day-punk,” lace, and leopard-infused junior wear from Material Girl and a few songs by Karmin, Bar III introduced Southwestern prints, dainty skirts, and hole-punched dresses with the air of an urban cowgirl searching for her inner romantic. Amidst a slideshow of luxe British interiors came Sean John’s lumberjack-streetwear for men; followed by Rachel Rachel Roy who let the glamour loose with a timeless black jumpsuit, effortless solid separates, and a wraparound cardigan reminiscent of a Native American rug in rich jewel tones. The eclectic influences met with inimitable ease made for a wow moment as models slowly spun by on an oversized vinyl record past strips of sparkling LCD lights. Almost as if in response to Roy’s swanky magnetism, Calvin Klein released minimal color-blocked pieces in a palette of red, white, black, and tan. Despite streamlined and professional separates for both men and women, the pièce de resistance proved to be a stunning caped ivory gown, altogether colorless and conservative yet full of sensual vitality. Nicole Richie extended the signature bohemian style for which she is known to her Macy’s Impulse collection, pairing a range of free-spirited prints with flowy peasant tops and dresses. Black, yellow, and soft neutrals carried throughout the collection, while an embellished velvet frock stood out in show stopping turquoise. Diesel’s parade of scantily clad men in jockey shorts and British headgear stirred the crowd into a sea of cat-calls, and Robin Thicke’s three song set brought the evening to a close in a flurry of sparkling confetti. As the packed auditorium filed out and into the night, there was nothing sweeter than being inspired by the chic and (on sale!) for a worthy cause. 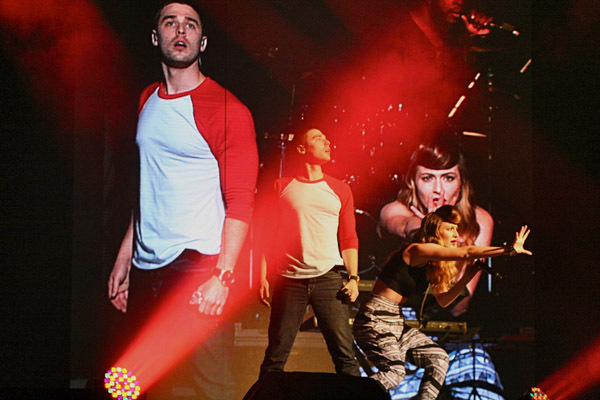 Karmin warms up the crowd. Fall looks from Bar III. 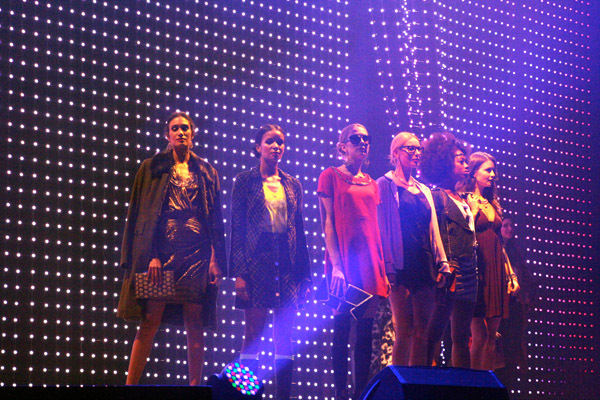 Models sporting the latest from Rachel Rachel Roy. 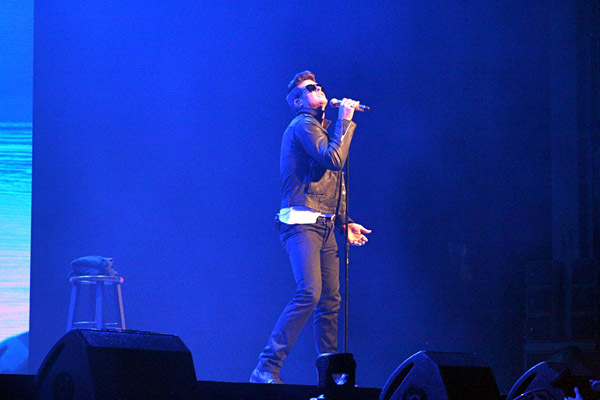 A performance by Robin Thicke ends the evening. Written by/Photos Courtesy of Noe Piters.